GE’s Marine Solutions has once again been selected by MSC Cruises and Fincantieri to provide the marine electric propulsion technology for two new Seaside EVO ships, further driving the evolution of the Seaside Class next-generation mega cruise ships. This follows the delivery of the first and second ship – MSC Seaside and MSC Seaview – in the Seaside Class by the Fincantieri shipyard of Monfalcone. With a gross tonnage of 169,400 GT and a total guest capacity of 5,632, Seaside EVO ships will be the largest cruise ships ever built by the Fincantieri shipyard. The two ships will adopt a range of innovative design features and maritime technologies, among which GE will provide the electric propulsion system with his partners Imesa and Nidec that will bring operational efficiency and excellent maneuverability. GE will also lead the consortium – Imesa, Nidec, ASI – for managing the overall electrical power and propulsion system. GE’s solution consists of propulsion controls along with transformers, variable frequency drive (VFD) technology, propulsion motors and distribution transformers. The propulsion system will see an increased power rating compared to those onboard the previous two vessels. GE’s electrical marine solution enables a smooth installation and cabling process. It also eliminates the need for harmonic filters. “Sailing full steam ahead, the Seaside Class showcases our commitment to pushing the boundary of the future of cruising by unlocking the maximized potential that a cruise ship can achieve. 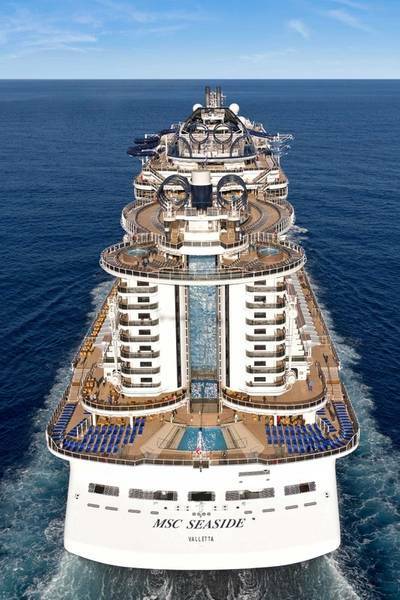 MSC Seaside EVO ships will be longer and consequently more powerful than the previous two ships concerning power generation and propulsion motors. And we once again place our trust and count on GE, among other various partners, to deliver the outcome,” said Emilio La Scala, President & Managing Director, MSC Cruise Management UK. “As the demand for cruise holidays soars, fleets continue to grow. While stringent regulations and increased vessel sizes may pose new challenges, they bring with them a host of opportunities. New regulations are driving for more efficient operations with reduced carbon footprint, while larger sizes of vessels will set new benchmarks for technology reliability,” said Azeez Mohammed, president and CEO of GE’s Power Conversion business. “GE’s marine electric propulsion is an attractive commercial solution for the growing cruise industry, and we are delighted to partner with a major cruise line and grow the industry with reliable and sustainable technology innovations,” he added.